Hey everyone. Just thought I’d drop in to update people on some key things about AURO’s progress and how it’s going. Firstly, a couple of general progress notes, and then some more interesting stuff about new directions for AURO. After almost two full years, we’re finally ready to enter a formal “finish the game” mode. What I mean by that is, until now, we’ve really been in a constant state of flux. Almost everything that we’ve done for the game so far has been sort of “temporary” or “placeholder” stuff (one of the notable exceptions being the pixel art, which is simply way too expensive, time-wise, to do over). Now, I think that the fact that we spent this much time in that state is one of the things that’s going to make the finished product be something really special. I’m glad that we didn’t enter this mode six months ago, and I’m really glad we didn’t a year ago. So, it is a positive thing, but there comes a time when we simply gotta nail things down and go, and that time is now. Basically, the only time that we’ll be doing anything over, from here on out, is if something is severely game/presentation breaking. Small adjustments will of course always be made to the game, including after release. Release Date / Beta Phase? We’ve been talking about it, and we want to shoot for completion in three months, plus one more month for polish/bug-fixing/balance. So, we can give an extremely tentative and penciled-in release date of October 15. Of course, we are not guaranteeing that we’ll actually be able to release on that day, but that’s what we’re shooting for. I think that it’s useful for us, the developers, to have a date like that in mind, and I think it’s also useful for you, the fans, to get some kind of idea of when you could possibly be seeing this product. This means we’ll probably be ready for our Beta phase as soon as next month. You’ll be hearing more about this in the coming days. We’re in need of some serious alpha testers who can meet with us daily to test new builds and give us feedback. We only need a handful, but if you’ve got a lot of time on your hands and would like to help us out, we’d love to hear from you. Sign up to be an alpha tester over here. The disciplines have been through the grinder so many times at this point now that we’re finally at a point where we’re happy with all of them. This isn’t to say they’re all perfect, but they’re all close enough to what they need to be that we’ll be able to make them work by tweaking them. We’ve now decided on a set of nine individual spells, each put into a discipline (here‘s a forum post laying out a little bit of information). The three disciplines are now Fire, Ice, and Air. Air used to be called Elude, but we realized that it was sort of the odd-man-out, being that the other two were elemental, and nouns. Expect a more in-depth write-up on the skills soon, but for now just know that there are nine of them and they’re really great. Lots of mechanical stuff has been sorted out. There have been quite a few weird mechanical details floating around that we hadn’t considered. Stuff like “what happens when you jump on an actor’s head?” or “when does a sliding object hurt a monster it collides with?” Everything has been pretty much laid to rest now, though (again, there may be small tweaks, but we’re pretty much solid). Check out the forum posts here, here, and the manual page on game mechanisms for more. HUD Re-vamp, new skill selection. I’m embarrassed that we were going with the old “folder” setup from before. Now we have a hard limit of 5 spells that Auro can learn throughout a game (which is plenty) plus two scrolls that he can hold. Here’s a mockup of the “skill-selection” screen. You can see, shadowed out, a hint of the new HUD (which also has not yet been rendered). 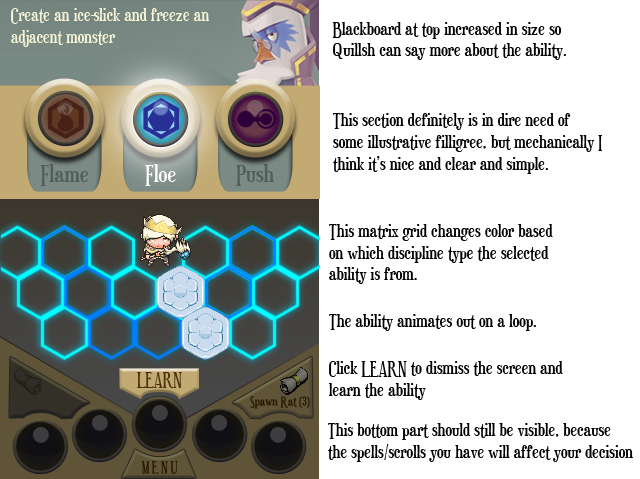 On this grid, the selected ability will be animating in a loop so that it's completely clear how the ability works. So what are we up to next? Well, finishing the game! We have about 4 or 5 more monsters to do, plus several characters that we need to do for Kickstarter fans. We need a logo for the game. We have a lot of bugs that have piled up over the past few weeks. We have to implement saving of scores. We have to implement story mode, and possibly puzzle mode. We have to write the rest of the music. And we have to do it all in the next 3-4 months! In the next couple days, I’ll write up a new post about some of the crazy, cool ideas I have for scoring for AURO. We really want to make this game revolutionary when it comes to its scoring system. That interface mock-up looks great- very touch friendly, specifically one hand/one thumb style (my favorite). The animation loop is choice as well, reminds me of choosing my ship in many “bullet hell” shooters or purchasing karate scrolls in God Hand; in the former it is merely a tantalizing preview of the player’s potential abilities, in the latter the animation itself, elegantly conveying hit timing and delay, is a crucial factor in deciding what moves to spend hard gambled resources on, and what order to combo them in. There have been so many games, ones that purport to be strategic or tactical, even, that rely only on cryptic text descriptions to convey info about potentially crucial ability choices… the face palming-sigh-“God dammit…” has to stop! Besides, of course, after good old fashioned dumb moves in a fair system. So, yeah, good stuff. Ha! Thanks, Padi, we just may use that. The name of the game here is depth through elegance – emergent complexity, not inherent. And yeah, we can always add more later if more are needed. Well that’s all you’ve got left to do? Well glad to see you guys are right on track and that you’ll be ready to release soon. I’ll be sure to try signing up for the alpha.